If you are considering moving your parents into an assisted living community now or in the future, are you wondering, how do I pay for assisted living? This is a concern for many families with parents on a fixed income who may or may not have planned for their future needs. Here are some options that your family can consider. As you assess assisted living community options, it is good to have a budget in mind of what you can afford. It is best to get a clear understanding of your parent’s finances and assets, as well as if any family members want to contribute, to create a budget. You may need to consider selling or renting their home for more cash. Like any apartment options or real estate investments, the expenses (or savings) of an assisted living community can be determined by the location and the amenities offered. We encourage you to tour multiple properties to understand and compare costs. Long term care insurance is different than traditional health insurance. It is designed to cover the costs of services and support when you can no longer care for yourself, whether that is in your home, at an assisted living community, memory care community, respite care, hospice care, or in a nursing home. The policyholder can select from a range of care options and benefits. Services can include caring for the activities of daily living such as bathing, toileting, and dressing, or skilled nursing, or occupational, speech or physical therapy. 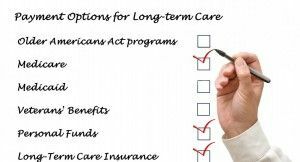 Long term care insurance typically covers what is not covered by health insurance, Medicare, or Medicaid. Under the VA Aid and Attendance Special Pension, also known as the A&A Pension, qualified veterans or their surviving spouses can receive tax-free monthly sums meant to help defray the costs of assisted living. Two married veterans can receive up to a maximum of $2,837 each month for this purpose, while a veteran and his or her spouse can receive up to $2,120. A sick spouse of a veteran may receive $1,788, and a surviving spouse may be entitled to $1,412 each month. If your loved one has a life insurance policy, you may be able to cash out the policy for a lump-sum to pay for assisted living expenses now. Contact the life insurance company to ask about “accelerated” or “living” benefits. The company that issued the policy to your parent will typically purchase it back for 50% to 75% of its value. This can be determined by the policy amount, monthly premiums, the policyholder’s age, or their heath condition. But each company is different and must be contacted directly to understand their rules and procedures. There are advantages and disadvantages of cashing out the policy, so research your options to best understand if this is a fit for your particular circumstance. Medicaid is a federal program for older people with low income and limited assets. The program is administered by each individual state with each state setting its own guidelines regarding eligibility and services. Over 40 states permit some type of funding for assisted living but it can vary greatly. To understand what could be covered under Medicaid within your state, visit the Centers for Medicare and Medicaid Services online. Check with the community you are considering to learn if they take medicaid or are private pay only. If you’ve been asking yourself, how do I pay for assisted living, we can help.